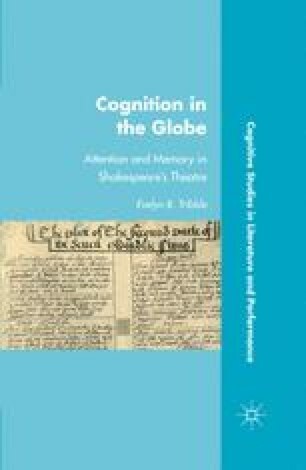 This chapter explores Distributed Cognition through examination of two major elements that comprise the stuff of memory: the physical environment of the stage and the cognitive artifacts used by the players to inform and shape their work. My key assumption is that the early modern theatre is a workplace. While this point is scarcely debatable, its full implications are not always realized. In fact, there is a strong strain of Shakespearean criticism overtly or implicitly hostile to the idea of the theatre as a business. One persistent strand of argument, for example, contrasts the purportedly dodgy business practices of Henslowe’s company with the more artistically high-minded practices of the Lord Chamberlain’s Men. F. G. Fleay suggested that Henslowe’s diary reveals not the practices of Shakespeare’s company, but instead “set[s] before us the selfish hand-to-mouth policy on which its principal rivals were guided” (1890/1964: 118). As C. C. Rutter (1999) and Knutson (1991: 15–20) document, this mythical distinction between commercial money-grubbing and the artistic aim of producing “plays of lasting interest” (Fleay 1890/1964: 117) had a strong hold on later theatrical historians.